Wonderful city apartment with breath taking views over Florence. The apartment, (70 square meter) is situated in the historical centre of Florence directly at the 'Piazza San Marco', one of the most beautiful historical public squares of the city. It is located at the 5th floor (without elevator) of an historical palace (XVIII century). The apartment, which has air condition is totally silent, from the balcony as well as from all windows you will enjoy a wonderful view over Florence and its monuments. 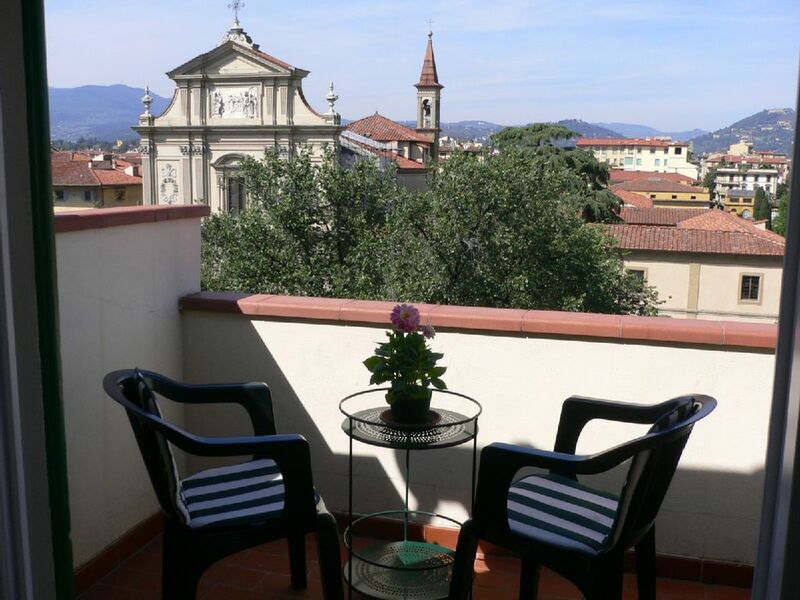 From the kitchen (refrigerator, freezer, dishwasher, oven and gas-cooker) you step on a nice roomy balcony where you can take breakfast while enjoying the wonderful view over San Marco Cathedral and the hills of Fiesole. The apartment has furthermore a large living/dining room with TV, two separate bedrooms (one with a comfortable double bed and a special view on the Dome of Florence) and a modern bathroom with shower. All main museums and monuments of Florence can be visited within walking distance. How to reach us: By car: Highway 1 Bologna - Firenze, Exit Firenze Nord, direction 'centro', direction 'Piazza San Marco'. Parking 'Parterre' nearby at Piazza della Libertà. By train: Florence main station (Santa Maria Novella) - 2 min with taxi or all buses with direction 'San Marco'. By airplane: Take a taxi (15 -20 min) or take a bus (Narvetta, the tickets you get on the bus) until Florence main station (Santa Maria Novella), than take a bus with direction 'San Marco'. Information to the surroundings: The apartment in Florence is located in one of the central squares of the city (Piazza San Marco) in the historic center of town. This district Cosimo il Vecchio has left its mark. Within the walls of this area once the menagerie of the Medici family was staying. Today it is the student quarter, and during the semester, the Piazza San Marco is always populated by young people who are waiting for the start of their lectures and art classes. The Accademia di Belli Arti founded in 1563 is the oldest art academy in the world, dating back to Michelangelo. Absolutely loved the apartment. So convenient to everything downtown, the bus station & the train station. Tiberio and Gabriella were very welcoming and offered many suggestions for the local flavor. We will stay here again when we return to Florence. Thank you LIsa & Fred, it was a pleasure to have you like our guest. I hope to meet you again in the future. Always WELCOME ! My family of 4 stayed here in July. The location was absolutely amazing! The rental was awesome, everything worked and was clean. The view off the balcony was great overlooking the square. Many eateries around this location so we never ate using the kitchen but it looked sufficiently stocked. Tiberio couldn't have been more gracious. Thank you again!!! Thank you Tylene !! You are always welcome !! Grazie Grant, YOU are always welcome back !! A calm bower above the city with quiet evenings and a stunning view of the Duomo. I'll be to the point: This place was quite spacious, well-equipped, and utterly convenient with inspiring 5th-floor views from the front balcony and the bedroom windows, which faced into a quiet back area and the Duomo glowing in the night about 1 block south. Perfectly situated for most major sites but also buses to Fiesoli and elsewhere. I'm guessing that the place if so inexpensive for what it offers because you have to walk up to the 5th floor, which didn't matter to us; one gets used to it quickly too. Meanwhile, having a grocery store with diverse alcohol, restaurants, and a pharmacy nearby really made it easy. One night, we had drinks on the deck with friends, and then dinner for 8 at the extendable dining-room table; I can't say how lovely it was to be able to stock one's fridge and cook meals. And Tiberio was extremely accommodating (as our flights got changed, etc.). Grazie Mille !!! Morgan & Dennis..... siete sempre di nuovo benvenuti !! We really loved the whole experience. Tiberio answered all of our calls and emails immediately and was very helpful meeting us and showing us the flat. The flat was spacious and well equipped. It's real selling point however are the views - from one side directly over the Duomo and from the other, of the hills beyond Florence. Absolutely delightful and such a central location. Thanks for all of your help Tiberio, we will definitely be back! you are always welcome !! It was a pleasure meeting you. This cosy appartment towering over the city could not be praised too highly. Every room is well furnished and nicely arranged. The splendid view from the terrace upon San Marco and the north hills, as much as the glorious view from the main bedroom upon the Duomo, are worth walking up the five flights of stairs. The hosts are unquestionably exquisite. We would be definitely glad to come back another time. always welcome again to our apartment !! Looking forward to meeting you agian !! Florence is one of the most beautiful cities of this world and offers an immeasurable wealth of art and culture treasures. The apartment is located in the historical part of Florence, directly at 'Piazza San Marco', from where you have the possibility, 'to dive in' the old part of Florence and discover the cultural objects of interest and secret corners of this fascinating city.